MetaSD - Page 79 of 81 - Don't just do something, stand there! 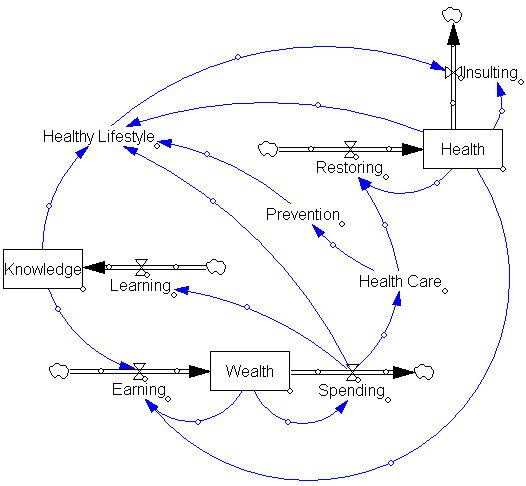 Reflections on the counterintuitive behavior of complex systems, seen through the eyes of System Dynamics, Systems Thinking and simulation. DeSmogBlog documents scientists’ outrage at inclusion on Dennis Avery’s list of 500 Scientists with Documented Doubts of Man-Made Global Warming Scares. Amusingly, the scientists concerned, a few of whom are deceased, are listed as “Co-Authors”. I’m going to put this new “open coauthoring” concept to work – I’m already working on abstracts. First, I think I’ll lower my Erdős number – Paul, dude, you can be my second. Next, I think I’ll team up with Einstein and Bohr to finish up quantum gravity. Mrs. Clinton would replace that money with the new tax on oil company profits, an idea that has been kicking around Congress for several years but has not been enacted into law. Mr. McCain would divert tax revenue from other sources to make the highway trust fund whole. Naked Capitalism asks Why Companies Aren’t Fighting Climate Change, citing interesting new work by Karin Thorburn and Karen Fisher-Vanden, which indicates that firms lose value when undertaking (or at least signaling) greenhouse gas emissions reductions. Specifically, we studied the stock market’s reaction when companies joined Climate Leaders, a voluntary government-industry partnership in which firms commit to a long-term reduction of their greenhouse gas emissions. Importantly, when the firms announced to the public that they were joining Climate Leaders their stock prices dropped significantly. The negative market reaction for firms joining Climate Leaders reveals that the reduction of greenhouse gases is a negative net present value project for the company. That is, the capital expenditures required to cut the carbon footprint exceed the present value of the expected future benefits from these investments, such as lower energy costs and increased revenue associated with the green goodwill. Some may argue that the decline in stock price is simply evidence that the market is near-sighted and ignores the long-term benefits of the green investments. Notice, however, that the stock market generally values uncertain cash flows in a distant future despite large investments today: earlier work has shown that firms announcing major capital expenditure programs and investments in research and development tend to experience an increase in their stock price. Similarly, the stock market often assigns substantial value to growth companies with negative current earnings, but with potential profits in the future. In fact, only two percent of the publicly traded firms in the United States have joined the Climate Leaders program to date, supporting our observation that initiatives aimed at curbing greenhouse gas emissions largely are value decreasing. Those who remember the 2002 commitment may recall that, at the time, emissions intensity had historically fallen by 1.3% per year on its own, so that the administration policy actually committed only to an additional 0.4% decline (assuming continuity with history). With GDP growth at about 3% per year, that would leave absolute emissions growing at about 1.7% per year. 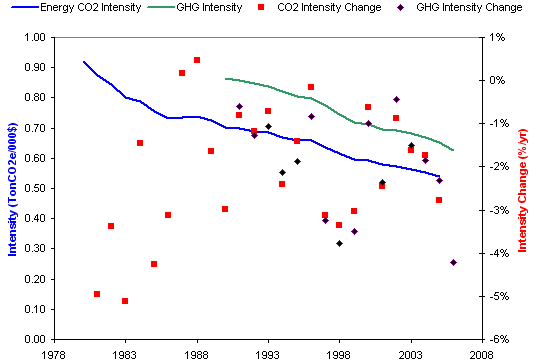 In fact, intensity has fallen about 2.5% per year since 2002, with much of that in 2006. Since it’s way too soon for investments in climate-related R&D to be having any effect, it’s likely that the savings are due to $100 oil. That is not an emissions reduction method that is likely to pass a cost-benefit test. A decrease in the globally averaged low level cloud cover, deduced from the ISCCP infrared data, as the cosmic ray intensity decreased during the solar cycle 22 was observed by two groups. The groups went on to hypothesize that the decrease in ionization due to cosmic rays causes the decrease in cloud cover, thereby explaining a large part of the currently observed global warming. We have examined this hypothesis to look for evidence to corroborate it. None has been found and so our conclusions are to doubt it. From the absence of corroborative evidence, we estimate that less than 23%, at the 95% confidence level, of the 11 year cycle change in the globally averaged cloud cover observed in solar cycle 22 is due to the change in the rate of ionization from the solar modulation of cosmic rays. Almost one-quarter of carbon dioxide released to the atmosphere is emitted in the production of internationally traded goods and services. Trade therefore represents an unrivalled, and unused, tool for reducing greenhouse gas emissions.